and I can modify the balance amount change and percent change thresholds to my desired level. Overall, the free service is not as advanced as other fee-based services that Equifax offers. But for the purpose of monitoring credit inquires and credit cards usages, it seems to be enough. 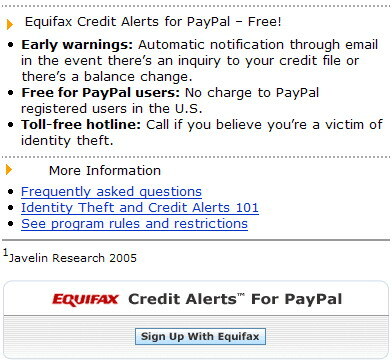 And since it is only an alert, you can’t really prevent the fraud from happening as it doesn’t put a stop when, for example, a higher than threshold amount is about to be charged on your credit cards. The registration process is also quite simple. The only concerned I had was when I was asked to provided my SSN and DoB, though I went to the page through a link in my Paypal account. 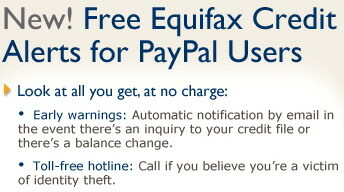 The order confirmation email was sent from Member.Benefits@equifax.com. If you want to try this free service, you may find the link on the left hand side of you My Account page. I have always been wondering do Experian, Equifax and TransUnion actually compete? If they do Experian and TransUnion will soon offer the same service. Or even something better.